Our range of products include general galvanising jobs and hot dip galvanizing. We even undertake general galvanising jobs. We do a hot dip galvanising of mild steel namely - beams, cable trays, gratings, flats, anlges , paltes and channels as well as foundation botls, trussels and perlins. etc. We are a trustyworthy organization offering a wide a gamut of Hot Dip Galvanizing. 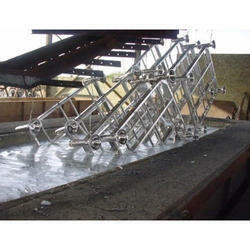 Looking for Hot Dip Galvanizing Service ?